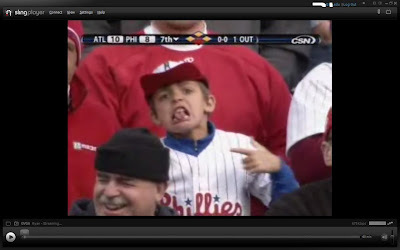 I have no idea how the Phillies won, but they did. I do not have any gripes with Charlie Manuel, except for that he may have left Joe Blanton in a little too long. The Phillies won this game because of their patience at the plate, and just like last year, they avoided an 0-3 start with a Businessman's-Special-, 5+ run-comeback-, 1-run victory. The off-day tomorrow will be a LOT less glum after today's win. Mr. Graham was in attendance (pictured above, blue undershirt), and I'm sure he'll have some commentary. Did I burn down the place? I can't use the old ones, with dried worm guts all over them. That's funny. I don't remember the cameras being on me.